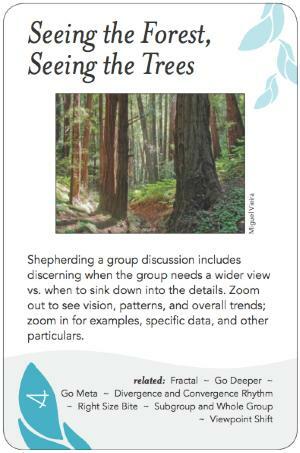 Shepherding a group discussion includes discerning when the group needs a wider view vs. when to sink down into the details. Zoom out to see vision, patterns, and overall trends; zoom in for examples, specific data, and other particulars. Most topics of group discusssion exist in a series of layers, levels or scales. Sometimes it's necessary to go up a level or two to get the "big picture" or a wider vision. It provides greater perspective and coherence, and commensurate insight about patterns that can't be seen from within or below, but at the cost of losing much of the often important detail that can't be seen from that height. So sometimes it's necessary to drill down a level or two to see those 'devilish' details, to listen to specifics and concrete stories that provide a deeper context and understanding. The facilitator may direct the conversation to a higher level by asking for similarities between objects or situations, looking for common characteristics or patterns, or asking meta-level questions that require the group to synthesize what they believe, know or imagine. Alternatively, the facilitator could use graphics to explain the higher-order process. A process map or social network diagram is a type of forest-for-the-trees view. A map will often show the pertinent connections, the network of nodes and connectors that bring together the constituent parts and an appreciation of how everything fits together (or why it fails to do so). Conversely, the facilitator may direct the conversation to a lower level by inviting stories, or by requesting details or specific data or examples that can reveal important information, insights or possibilities that are invisible from the 30,000 foot view. Finding a bottleneck in a system by stepping back from the details and taking a birds'-eye view. Understanding the patterns of communication in a network. Investigating processes instead of isolated events. Letter from Isaac Newton to Robert Hooke in 1676: "If I have seen further it is by standing on the shoulders of Giants."